In the middle of New Jersey exists a strange landscape of wetlands and wildlife migrations, garbage dumps and the ruins of industry, toxic waste sites and a river that tells the story of a civilization’s new frontier. That is what seven young people have chosen to paddle through for 10 days, in canoes... A singular expedition, as romantic as it is political. The soundtrack for Back Water by Kevin O’Connor from Talkdemonic is now available here. It’s a gorgeous haunting score that is now available on Spotify, Apple Store, Amazon and other outlets. Available formats: BluRay disc, Quicktime Pro-Res le, or DCP upon request. BACK WATER: In the middle of New Jersey exists a strange landscape of wetlands and wildlife migrations, garbage dumps and the ruins of industry, toxic waste sites and a river that tells the story of a civilization’s new frontier. That is what seven young people have chosen to paddle through for 10 days, in canoes… A singular expedition, as romantic as it is political. 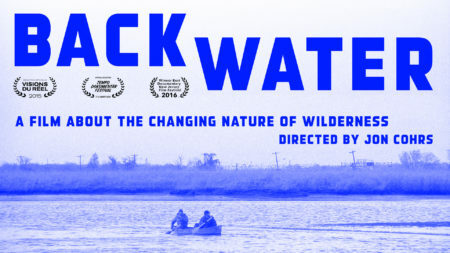 SYNOPSIS: BACK WATER is a thought-provoking and humorous look at the changing nature of wilderness. It follows a group of explorers as they set out on an expedition to a new frontier consisting of toxic waste dumps and abandoned factories. In this swampy wetland just miles from the heart of Manhattan, they work their way south by canoe, paddling past the relics of manufacturing, an Agent Orange remediation site, and the ghosts of the old Penn Station, attempting to survive in an environment where wildlife and industry co-exist. As the team is confronted by natural elements such as wildfires and flood-tides, and as man-made toxic spills threaten their water supply, each character reveal their unique perspective on their place in this strange new landscape. Like any expedition into the unknown, the explorers are constantly met with surprises: a hunt for an Agent Orange storage site leads instead to poachers trapping turtles; in a world where “natural flavors” are advertised by green pastures and pristine waters, the explorers stumble upon one of the highest concentrations of artificial flavoring and processed food factories in the world. Against this back drop of birds and factories, open sky and highway overpasses, the explorers contemplate the co-existence of mankind and wildlife in our post-industrial world, constantly reminded of the contradictions inherent in such a landscape.